More and more aspects of the modern cars only function with electricity. When defects occur on electrical consumers, sensors and actuators, the first thing is a proper diagnosis. To this end, KS Tools now supplies a new digital ammeter with clamp function. With this measuring equipment, not only can reliable current measurements be made without having to interrupt the electrical circuit, but the equipment also has a fully-fledged multimeter and can thus also be used for other measurement categories as well as measurement ranges in the course of troubleshooting on electrical components. The advantage of the clamp ammeter is that its utilisation considerably simplifies the search for hidden current consumers. The new digital clamp ammeter 200 A is obtainable from KS Tools under the product number 150.1745. „In a modern workshop not a day goes by during which currents don‘t have to be measured“, declares the KS Tools project management. „To this end, with our new digital clamp ammeter we‘re delivering a useful tool for different measurements in the electrical circuit.“ It assists in the rapid and safe diagnosis of electrical consumers, sensors and actuators. It gives good service particularly with tracing hidden current consumers. When customers complain of the battery constantly discharging then fast and reliable help is needed. The clamp allows the closed current consumption of the on-board electrical system to be checked precisely. To do so, it suffices to position the clamp around the supply cable to the starter battery so that it displays the exact measured value. Unlike other measuring instruments the electrical circuit doesn‘t have to be disconnected in this case. So there are no entries in the error memory due to voltage drop. At the same time there are no downsides to the measurement technique due to an interconnected ammeter which would distort the internal resistance under such circumstances. Because the clamp is very compact, it is also well suited for tight measurement points. It opens up to a diameter of 30 millimetres and takes current measurements with a resolution of 0.01 up to 200 Amperes. 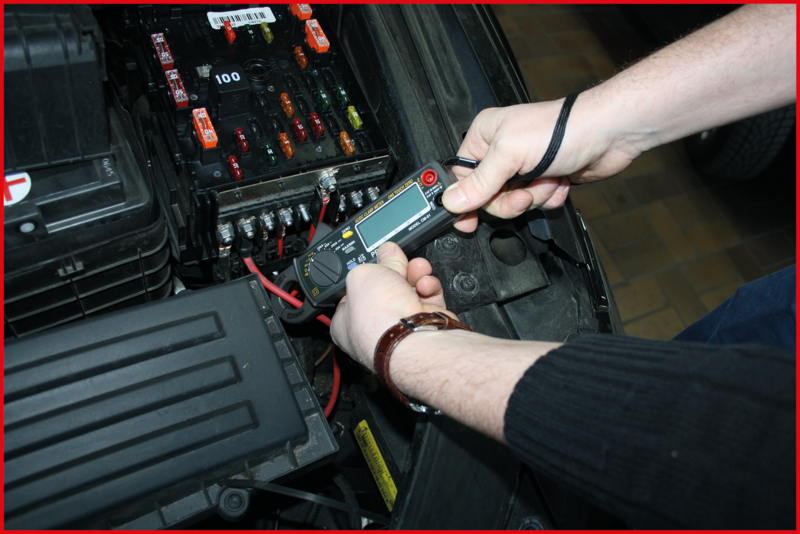 The integrated multimeter renders an additional measuring instrument superfluous. The large, brightly illuminated and easy to read four-digit LCD display with digital and bargraph indication provides optimum measured value legibility. The measuring equipment has a manual measurement range selection, is simple to operate and is fitted with a zero key. For even greater convenience the measured value can be frozen on the display then read off at a later point in time. The user can also determine the peak current at engine impact loads. This is done with the aid of a Min / Max function. The clamp has been developed specially for applications in the motor vehicle field and is characterised by its high degree of measurement accuracy. The housing is very robust and at the same time compact. The design of the equipment also permits it to be operated easily with only one hand. It is moreover screened against the influences of electromagnet disturbance. Its extended measurement functions replace a multimeter. KS Tools supplies the digital clamp ammeter complete with test prods and carrying case.